Neyber’s 2016 and 2017 studies delivered some really great insights into the world of personal finance from both an employee and employer perspective. It has enabled Neyber to take a really deep dive into how ordinary working people feel about their financial situation and how the UK’s financial landscape has changed over the last few years. 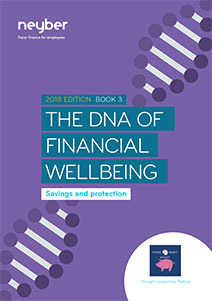 This year’s research has been divided into a series of booklets: each one taking a close look at key aspects of financial wellbeing, exploring employees’ relationships with financial planning, savings, getting ready for retirement and more. 10,000 employees and 580 employers were surveyed to compile this research and in this free eBook the focus is on the importance of savings and protection, and how this can be signifiicant impact on employees’ overall wellbeing. The earlier we can start good habits in respect of saving, the more in control we feel and the better we are able to cope should something unexpected happen. Download the eBook to review the latest research from Neyber on financial wellbeing and what employers and employees alike are doing to ensure good habits. Complete the form below to download.